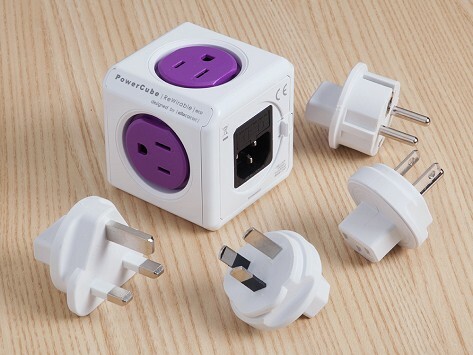 The PowerCube Travel Adapter allows you to easily turn your PowerCube into a travel outlet. Comes with adapter plugs for 4 different standard outlets. Dimensions: 2.5" x 2.5" x 3"
Easy to pack; very handy to use anywhere. We travel overseas a fair bit, and this cube is fantastic. PowerCube is a modern reinvention of the traditional power strip. It offers more functionality—like two added USB ports—and is made to look better, too. Charge your smartphone, tablet and more with this USB outlet adapter that also offers four traditional power outlets. The clever cube shape erases the problem of having two plugs that are too big to fit next to each other. On PowerCube, you can use every single outlet. You can even stack PowerCubes to get more outlets as needed. PowerCube looks better than power strips or extension cords, and it’s far easier to keep within reach. 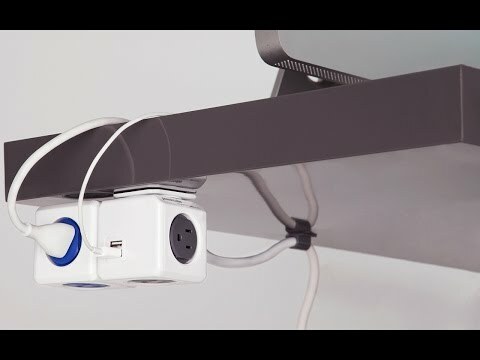 With optional mounting accessories, it can be put on a desk, under a table—wherever you need power. No more crawling behind furniture to reach outlets. Plugging in and charging up is now convenient for our tech-happy world.